Kuringai Soil Recycling transports soil from building sites throughout Sydney metroplitan area and delivers to sites that require a specific material. We remove clean, certified soil from local building sites and will deliver it to jobs and properties as required. Larger orders will be leveled and compacted at no cost to you*. We can create a level platform for your subdivision, warehouse, shed, entertaining area, yard or even a dressage arena. Need a new dam? 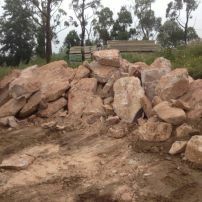 We can deliver clay for lining and certified material to build the wall, no excavation required! KSR can also upgrade your private road/property access. KSR also screen and enhance soils and natural gravel for re sale, call for a current price list of topsoil, garden mix, sandstone gravel and rocks for drainage, We also supply stone/rocks for gabion baskets. *Free of cost is subject to distance from source and access.Call Wayne for a site evaluation. 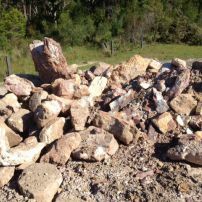 commented on "Kuringai soil recycling currently has available hundreds of tonnes of sandstone boulders and rocks, varing in size from half a car to ..."